How much does it cost to travel to La Paz? How much money will you need in La Paz? $b167 ($24) is the average daily price for traveling in La Paz. The average price of food for one day is $b70 ($10). The average price of a hotel for a couple is $b136 ($20). Additional pricing is in the table below. These average travel prices have been collected from other travelers to help you plan your own travel budget. How expensive is La Paz? How much money do I need for La Paz? La Paz, the administrative capital of Bolivia, has a breathtaking setting. The city is the highest national capital in the world, with an altitude ranging from about 4,058 m (13,313 ft) above sea level in El Alto, where the airport is located, to 3,100 m (10,170 ft) in the lower residential area. The dynamic and chaotic city was built in a canyon created by the Choqueyapu River. La Paz is now a fusion of architectural styles, cultures and beliefs, welcoming everyday new boutique hotels, modern shops, delicious restaurants and reinventing standing establishments. However, generally speaking, Bolivia remains more a backpacker hit than a mainstream tourist destination. La Paz has plenty of exciting sights to offer. Do not miss the Wrestling Cholitas on Sunday afternoons at the Multifuncional de la Ceja de El Alto (USD$8.50), where indigenous Aymara women, wrestle in petticoats and pigtails accompanied with strident music. Head to Latin America&apos;s largest open-air market, the Feria 16 de Julio. To get there, experience Mi Teleferico&apos;s red line, where you will get sensational views over the city skyscrapers, Cordillera Real and the ramshackle terracotta-coloured buildings that cover the upper slopes. Mi Teleferico, the world&apos;s longest and highest urban cable car network, is making it easier to get around the city. Visit the Mercado de las brujas, up from San Francisco Church, between Calle Jimenez and Linares, where you will find all manner of mysterious powders, potions and amulets linked to Andean beliefs and shamanic practices. Walk around the Calle Jaen, the best-preserved colonial street in La Paz, home to a few new boutiques, galleries and five small museums that can be visited on a single ticket. The Museo de Instrumentos Musicales for ancient nose flutes and the Museo de Metales Preciosos for pre-Colombian gold. Museo del Litoral Boliviano has extraordinary historical maps, the Museo Casa Murillo presents interesting insights on colonial life and the Museo Costumbrista Juan de Vargas, where you can buy the ticket, displays the city&apos;s traditions. Another Museum worth visiting in La Paz is the National Museum of Ethnography and Folklore (Musef), found in an 18th-century palace. The museum presents a collection of festival masks, Andean ceramics and intricate weavings, including chullos, the iconic knitted hats with earflaps and other fascinating objects in an attempt to give a colourful and contemporary overview of Bolivia&apos;s diverse cultures. Bolivia is going under a gastronomic revolution with plenty of restaurants using only Bolivian ingredients. Vegeterian fine-dining restaurants are introduced with great success to the meat-loving capital. To fully experience the Pacenos life, eat in the street for less than USD$2. From tasty chorizo sandwiches to deep-fried pastries packed with meat or vegetables, discover the delicious Bolivian staple food. To get to La Paz, you can fly to the world’s highest international airport, El Alto International Airport. Most South American airlines serve El Alto Airport as well as local airlines. Most international flights will make a stop over in Santa Cruz to pick up or drop off passengers. American Airlines is currently the only U.S. carrier serving Bolivia, with one daily flight from Miami. 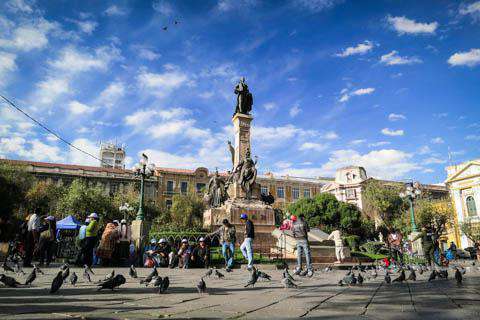 If you are travelling by bus around Bolivia or from surrounding countries, the main bus terminal is in the Parque Urbano Central, near the upper end of the Prado and a 15-20 min walk from most hostels. Note that buses arriving from Lake Titicaca (the route for entering overland from Puno, Peru) and Sorata terminate at a square near the city cemetery farther to the west. Buses from Quime terminate in the El Alto bus terminal. There is no need to buy tickets upfront in one of the many travel agencies as they can often charge you more without being honest about the service they are selling. Show up a few hours before the scheduled departure at the terminal and buy your tickets there. Another option to go from La Paz to Cusco, Copacabana or Puno is to take one of the Bolivia Hop buses. Bolivia hop is a new company and appears to be well ran and very safe, allowing you to hop on or hop off at any of these places. Otherwise, if you are feeling courageous, hundreds of people cycle around Bolivia each year, passing through La Paz and discovering the rest of the country on their bike.